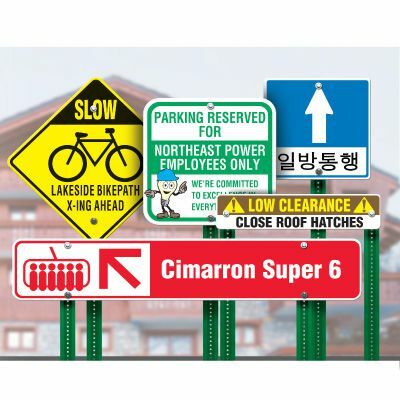 Create your custom traffic and parking signs to suit your needs. Custom sized to fit any space. Supply your wording and logo, and select from a variety of available graphics. Material options: Aluminum or Polyethylene. Choose from Non-Reflective, Engineer-Grade Reflective (500 ft. visibility range), or High-Intensity Reflective (1,000 ft. visibility range) for ultimate safety and visibility. Add Duroshield Topcoat to protect your signs for life against harsh weather conditions, graffiti, chemicals, and more.